Cilantro Crack sauce is named as such because due to it’s tangy and incredible flavor, you will immediately want to put it on everything, unlike the real crack that will just make you homeless and possibly dead. I have only published one recipe that sucked that that was for this very sauce a few years back. I realized that I gave you guys something that could have turned out not crack-like, so here it is, the updated and new and improved Genuine Cliantro Crack Sauce. This stuff tastes great on everything, but watch the video for more specific ideas! Once upon a Christmas Eve a few years back I experienced the spirit of Colombian Christmas like never before. There was chorizo and empanadas and aguardiente and arepas, but the one item that caused me to fall to my knees in gratitude was the cilantro crack sauce. We put it on everything that night. There wasn’t a piece of chorizo, empanada, arepa or piece of cardboard that didn’t get smothered in this sauce. Now don’t be thinking that there was actually crack in that sauce because I am Colombian. Remember, we don’t do the drugs, we just sell them to you. The reason we named, or maybe I named, the sauce “crack sauce” is because I have heard that this crack substance is quite addictive and so is the silky green sauce to which this post is dedicated. For a while, I tried to imitate it from memory, but it never quite had that “yo no se que” that it did that Christmas Eve. Please do not take this recipe lightly even though it seems simple. It WILL change your life. I know that most of you don’t have Colombian chorizo and empanadas around to cover with this sauce, but alas, the possibilities are endless and I will list some below. 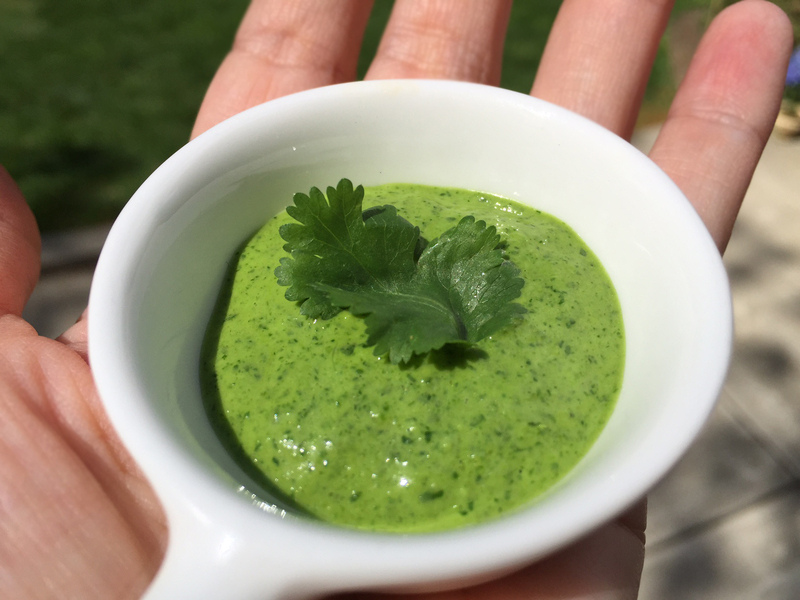 Place all ingredients in the bullet or blender… you may have to start with half the cilantro if using a small bullet like I did. Pulse until smooth. Taste… if you do not pucker at all, add a few more drops of white vinegar until you do. Grilled food: Drizzle over shrimp, skirt steak or flank steak. Tacos: Put a dollop over fish tacos or any tacos. Sausage: Eat with grilled Bratwurst or any sausage that might go well with cilantro. Salad: Use as a salad dressing, but use sparingly. Pasta: Toss with penne and grilled chicken and top with chopped red peppers for a fresh pasta dish. THE SAUCE should keep for about 3-4 days in the fridge.